Our space is made up of two connecting buildings. 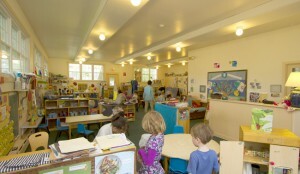 Our Toddlers and Threes have their own building, consisting of a series of seven rooms. Toddler rooms are designed to minimize the number of transitions the little ones make during the day, whereas our Toddler Transition and Threes rotate through the school to different areas. There are numerous areas for time alone and cozy pillows for snuggling, all arranged for easy teacher supervision, as well as open spaces for music times, dancing and instruments. 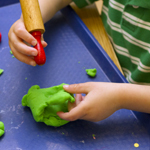 Our interest areas include, dramatic play, puzzle, fine motor, large motor, block, art, early literacy, science, and cooking. The Pre-Kindergarten building is structured very much like a kindergarten classroom, filled with learning centers and interest areas. Our interest areas include, dramatic play,kitchen, office, puppets, writing, fine motor, block, library, science, art and texture table. Large areas are available for twice weekly music class, creative dramatics, yoga and creative movement. Our location in the village of Saybrook is perfect for buggy walks with Toddlers, field trips to Main Street and weekly PreK library trips. 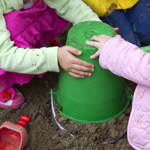 Outside space is divided by age groups for developmentally appropriate equipment, science activities and props. The doors, of both buildings, open to their age specific playgrounds. The playgrounds are completely fenced and have childproof gates. The playground fosters lots of imaginative play, with many places to build, dig, balance, and climb. 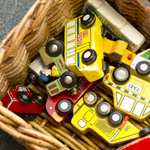 Safety is our primary concern, while still allowing for the children to have many choices in play.